This article introduces commonly-used transformers and discusses the uses of each type. Building on our overview of isolators and chokes, let’s discuss transformers. Most commonly, transformers (abbreviated as “T”) are passive components that consist of two wires wound around an iron-containing core. The first coil connects to the input source of alternating current (AC). Because the current alternates, there is a varying magnetic field around the first coil which produces an alternating current in the second coil. The second coil connects to a different circuit, giving an output. Transformers can be hard to identify at times (as some can be mistaken for common-mode chokes). Many transformers have 4 connectors (two coils connected via a core), but some may have more. Transformers that have more than 4 connectors may have multiple tap points, separate cores, and split cores. This type of transformer is most common in power circuitry and is often wrapped in plastic to prevent damage to the copper wire. 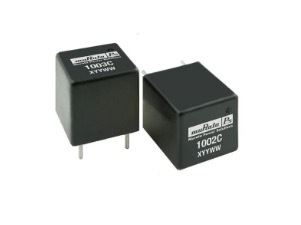 These transformers range in size and type with some having only one output while others may have many outputs. Sometimes this type of transformer has a part number labeled on them which is critical when determining which wires do what (using the datasheet) and outputs are often color coded. A toroidal transformer. Image courtesy of Mouser. 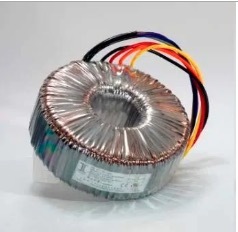 The larger the toroid, the higher the power of the transformer and these types of transformers are absolutely worth salvaging toroidal transformers can be pricey. 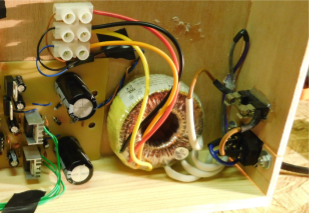 A simple AC-DC power supply with a toroidal transformer. Like most transformers, through-hole transformers are found in power applications and this particular type of transformer is most common in power supplies for low power devices such as laptops and chargers. They are often rectangular in shape and have at least 4 pins (but typically have more than 5 pins). Some have a plastic sheet that is wrapped around the windings whereas others may not. While there is no definite color scheme, yellow is one of the more common colors for the plastic wrap but other colors do exist. Multiple PCB transformers on a power unit. SMD transformers are often larger than most SMD components and are very similar in appearance to through-hole transformers. 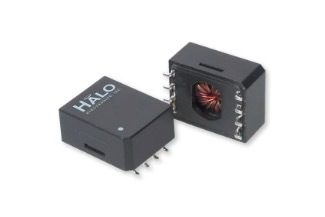 Unlike through-hole transformers, SMD transformers have component legs that bend outward, allowing for surface mounting. These transformers are easier to salvage than through-hole varieties and just like all transformers they should be salvaged as they can be useful in other projects as well as being potentially pricey. An SMD transformer. Image courtesy of Mouser.